Amid growing 4G penetration in India, Navi Mumbai scored an impressive 8.1 Mbps in average LTE download speed to top 4G download speeds while Allahabad grabbed the last spot with an average of 4.0 Mbps speed, London-based wireless coverage mapping company OpenSignal said on Wednesday. According to the company, four million smartphone users in 20 cities across India experienced average download speeds of 16.8 Mbps, compared with the daily average of 6.5 Mbps. Thus download speeds are up to 4.5 times faster at night. Even in 2017, Navi Mumbai has the highest 4G download speeds of 8.72 Mbps, but the average download speed is now reduced to 8.1 Mbps in 2018, according to OpenSignal’s report. When the mobile network is busiest, the average LTE download speed drops 2.8 Mbps compared to the daily average with users in Allahabad experiencing the slowest 4G download speed at 2 Mbps. However, when the network is less congested, download speeds jump on average by 10.3 Mbps, with Indore hitting the highest speed of 21.6 Mbps. 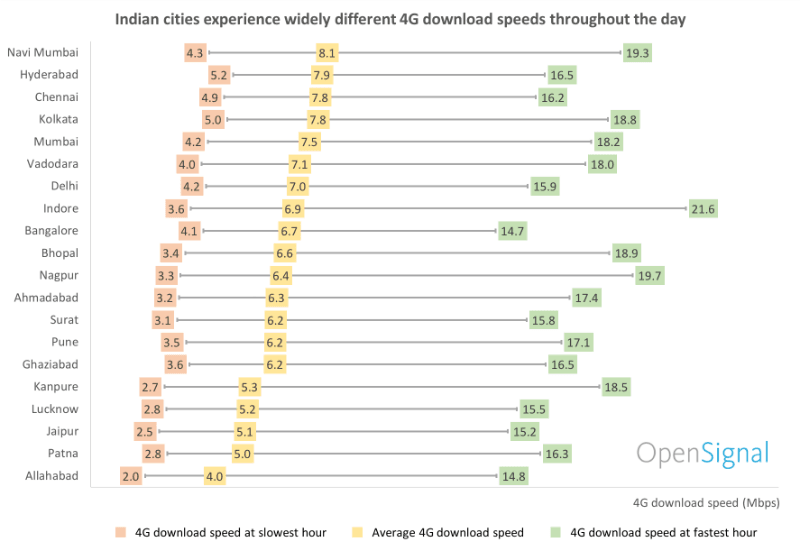 All the cities witness speeds that tend to decrease over the course of the day and reach the slowest at 10 PM when presumably most users are connected to the Internet accessing entertainment services on the mobile. My Father has scrapped his Broadband Connection and uses JioFi in his Office whole day. I’ve seen people using Idea Dongles in Banks and other Government Offices. Since load increases during daytime which isn’t the case after evening therefore speeds are better at night as if compared in day/business hours. PS : I’m facing below usable Speeds on AirTel and Idea between 9-11. Around 10 internet won’t work or competes snail. Already seen many users reporting the same on TT. Patiently waiting for this to get fix. Again Tamilnadu is ignored. Only Chennai is chosen. Why not Madhurai, Palani, Dindigul etc?.